Registration for Story Time Slime Online™ is $249 per person. The registration fee includes access to the five hour course for one year and a hands-on kit valued at $50 shipped to your door!. Story Time Slime™ Online is more than just a collection of great hands-on activities… it’s a whole new way to teach science through the medium of children’s literature. Julie Gintzler and Steve Spangler guide you through more than 20 experiences using easy to find materials and learning resources from the hands-on science kit that is delivered to your door. This workshop is perfect for any early childhood educator who is looking to add more science and literature into their teachings. PROFESSIONAL DEVELOPMENT DELIVERED RIGHT TO YOUR DOOR! 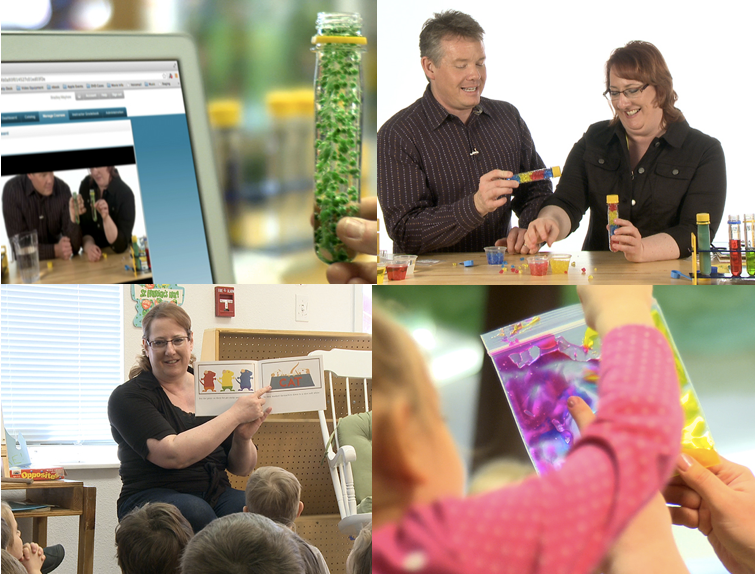 Julie Gintzler and Steve Spangler share their enthusiasm, experience and creativity for making early childhood science fun, easy and totally engaging with this online course. It’s a unique kind of professional development that’s focused on making you the most effective teacher possible… and it’s delivered right to your door. Take the course at your own pace. You have a year to complete it! NGSS & Common Core connections in a downloadable 24 page PDF. Shipping costs for your materials is included with your registration fee. Downloadable certificate of completion showing 5 hours. Earn graduate-level professional development semester credit for an additional fee. Group pricing available for groups of five or more. This is not your ordinary online course. From the moment the training starts, Julie Gintzler and Steve Spangler draw you in and make you a part of the learning process. You’ll quickly see why Julie and Steve are so passionate about helping you be the best teacher possible by creating learning connections that children remember. The Spangler Science team has found a way to turn an online training into a totally interactive experience. That’s why we’re sending you a workshop kit filled with all of the hands-on materials you’ll need to conduct the activities as you watch and learn online. It’s the next best thing to attending a live training with two amazing education experts… without ever having to leave home. When you register – you’ll get instant access to the online training and receive your kit within 5-7 days of signing up!